In a joint project with Govannon Consultancy we have carried out a “Level 3” building record of the disused hospital at Bryn Sieont, Caernarfon. At the core of the hospital complex is a Mid Victorian gentleman’s residence built in 1872. This was converted into a T.B. Hospital in 1914 and transferred to the Welsh Regional Hospitals Board in 1948. More recently the buildings have been used as a hospital offering palliative care by Macmillan nurses for cancer patients and then a centre used by the Blood Transfusion Service and a base for ambulances. The 1872 building is distinctive, constructed of yellow brick with red brick decoration in the form of a series of string courses and gable end decoration. Inside it also retains some feature from its original use including an impressive main staircase. 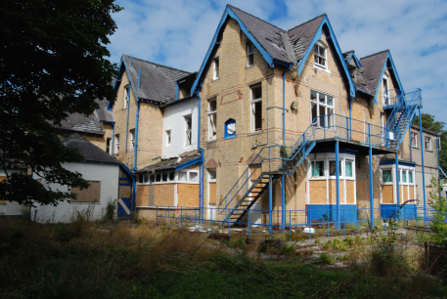 The later buildings attached to the house were also recorded including a Terminal Care Unit and Geriatric Unit constructed in the 1970’s.